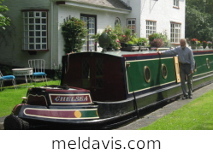 Mel Davis Boatbuilders - Narrowboats for Sale. Currently we have no pre-owned Mel Davis boats for sale. However, please enquire regarding a new build, or browse our picture gallery. Mel Davis Boatbuilders provide a commission-free broking service for all MDBB customers when our boats are offered for resale. 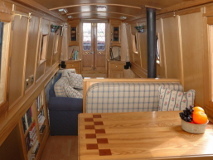 60' (18.3m) Mel Davis traditional style narrowboat for sale. 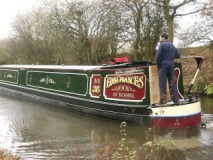 A true superstar narrowboat! As featured in TV’s “Waterworld” series. Externally she has taditional steelwork features: sunken panels, potter's cabin and four side hatches. Paint and signwriting by Andy Russell. Propulsion is by a Beta Marine JD3 tug engine. Inside there is a stunning fitout by Anthony-M in panelled american ash. Two double berths with an additional single in the boatman's cabin. Boatman's cabin fitted out in tulip wood. Launched in July 2002 this boat is the height of luxury at a special price. More pictures of this boat in our gallery. For any further details, please get in touch. A 60ft (18.3m) Mel Davis-built traditional narrow boat with sunken curved back panels and many of our special features, including two hatches and 11 portholes. 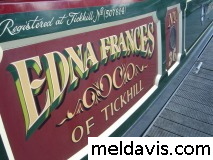 This is your chance to own a fully fitted MEL DAVIS traditional narrowboat NOW - no waiting! Only two years old, this fully fitted boat is foam insulated and lined to a high specification in american white ash. Saloon with Bubble dual fuel stove and fixed sofas which extend into a massive bed. Bathroom amid-ship with second cassette loo, hand basin and shower over bath. Dining area suitable for 6, converts into bunk beds as required. 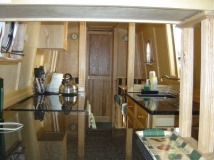 Galley with range cooker, fridge, washing machine and spectacular granite work surfaces. She is fitted with a 43hp Barrus Shire engine with 240-volt alternator, travel pack, inverter and engine management system. Complete with bow-thruster, this boat must be seen to be believed. Originally purchased as part of the owner's retirement plan. Retirement is now delayed so it is not fair to deny this luxury boat to someone who wants it now!! 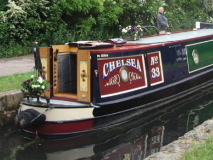 Complete with reserved mooring at Kingswood Junction on the Stratford and Grand Union Canals. The agreed price will include this year's licence fee. Browse the picture gallery for this boat.